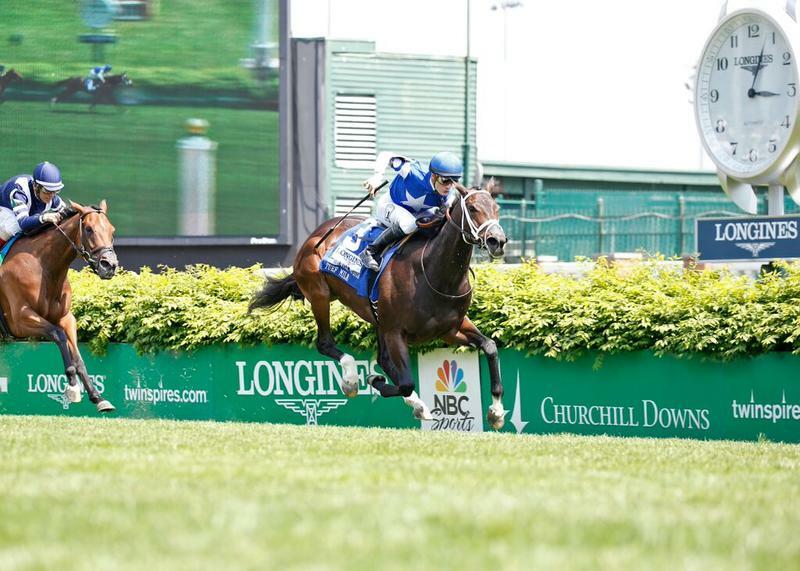 LNJ Foxwoods’ Super Majesty headlines a field of a dozen 3-year-old fillies in Churchill Downs’ $100,000 Dogwood (GIII), the ninth race on Saturday’s 11-race Downs After Dark card. The homebred daughter of 2010 Kentucky Derby winner Super Saver ships in from southern California and has won two victories by a combined 21 ½ lengths in three starts for Hall of Fame trainer Jerry Hollendorfer. Her only setback came in her most recent start in an allowance optional claiming event at Del Mar, where she lost by a nose to 28-1 longshot Kyriaki. 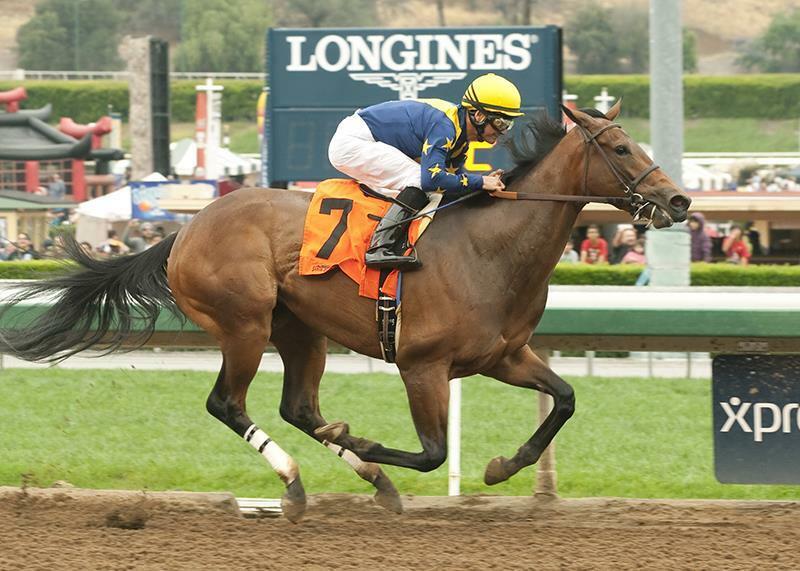 Hollendorfer, who flew to Kentucky this week for the Keeneland September yearling sale, hopes that his highly-regarded filly has what it takes to add a graded stakes victory to her resume. Her last breeze was a five-furlong bullet in :59.40 on Sept. 14 at Santa Anita. Hollendorfer has a start in the $1 million Breeders’ Cup Filly & Mare Sprint (GI) in mind if Super Majesty runs well on Saturday night. “I think if she can run well on Saturday, we would really like to do that,” Hollendorfer said. Hollendorfer was in Kentucky this week for the Keeneland September Yearling Sale, but will not be at Churchill Downs to saddle his rising star on Saturday night. He will instead be at Pennsylvania’s Parx Racing to saddle Tara’s Tango in the $1 million Cotillion (GI) and Iron Fist in the $1 million Pennsylvania Derby (GII) Hollendorfer said that either Steve Asmussen or Asmussen assistant Scott Blasi would saddle Super Majesty in the Dogwood. Jockey Alex Solis, the pilot in all three of her career starts, has the mount for Hollendorfer on Saturday night. Also trying to collect her first graded stakes is Five D Thoroughbreds’ Kathballu, who comes into the Dogwood off of a fifth-place effort in the Test (GI) at Saratoga. The homebred daughter of Bluegrass Cat only has two victories from nine career starts, but both came at Churchill Downs. Trainer Kenny McPeek, who won this race with Take Charge Lady (2002) and Salty Strike (2011) is satisfied with how she has been training and has pointed Kathballu toward the Dogwood. Early on in her career, McPeek ran the filly around two turns. She was successful her maiden victory last November, the trainer believes that her chances improve at shorter distances. Julien Leparoux, who was aboard Kathballu for both of her victories, has the mount. Glenmare Farm LLC’s I’m A Looker, a daughter of Henny Hughes out of the female family that produced 2015 Kentucky Derby Presented by Yum! 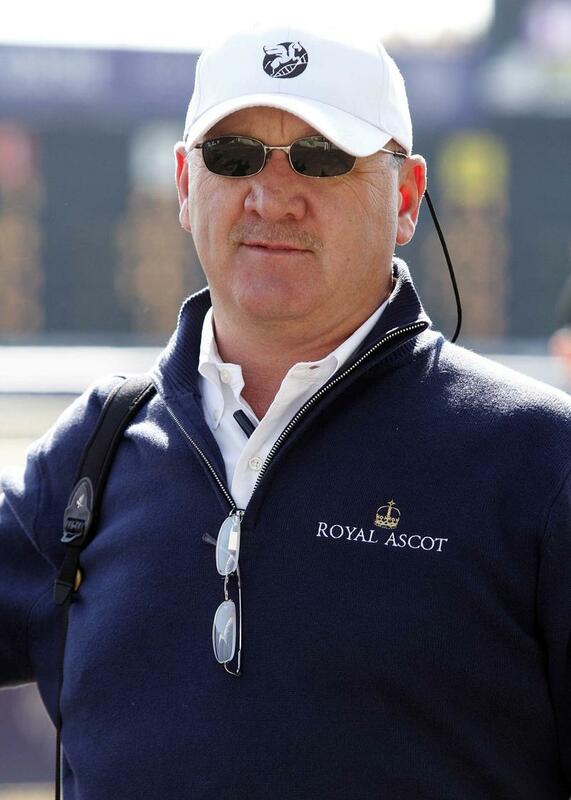 Brands (GI) third-place finisher Dortmund, enters the Dogwood off a third-place effort in the Azalea (GII) at Gulfstream Park, where she was beaten only four lengths by the victorious Dogwood Trail and favored runner-up Huasca. Both fillies that finished in front of I’m A Looker that day have won a stakes race since the Azalea. Dupuy pointed out how, while the filly has yet to win against stakes rivals, she has been running against some of the best fillies in 3-year-old division. While I’m A Looker is 0-for-4 against stakes rivals, Dupuy believes his filly will run a breakthrough race soon. Never off the board in nine career starts, Bernard G. Schaeffer’s Heart’s Song’s only previous start against graded stakes company came in last November’s Golden Rod (GII), where the William Connelly trainee finished third, beaten 7 ½ lengths. Heart’s Song has been at her best at Churchill Downs. Her record under the Twin Spires is 4-2-1-1, which includes a maiden and allowance victory. “She won here in the summer at the end of June, so she likes the track,” Connelly said. “The (Dogwood) is a good opportunity to earn some graded black type on her. Jon Court, who rode the filly once before to a runner-up effort in the Miss Indiana Stakes at Indiana Grand last November, will be aboard the filly for the Dogwood. The field for the Dogwood, from rail out (with jockey and odds): All Day Alice (Rosemary Homeister, Jr., 30-1); Zeven (Robby Albarado, 10-1); I’m A Looker (Francisco Torres, 15-1); Chide (Shaun Bridgmohan, 6-1); Super Majesty (Alex Solis, 5-2); Pleasant Tales (Jamie Theriot III, 15-1); Sweet Swingin (Channing Hill, 12-1); Huasca (Eddie Castro, 7-2); Street Song (Chris Landeros, 20-1); Kathballu (Julien Leparoux, 6-1); Heart’s Song (Jon Court, 12-1); Sweet Success (Corey Lanerie, 12-1). TEPIN, WORLD APPROVAL,WORK ALL WEEK BREEZE- Robert E. Masterson’s Churchill Downs Distaff Turf Mile (GII) winner Tepin returned to the work tab on Friday morning. The 4-year-old daughter of Bernstein worked a bullet going five furlongs in 1:00.40, her first workout since a runner-up effort in the Ballston Spa (GII) at Saratoga. Norman Casse, assistantrainer t to his father Mark, said Tepin would make her next start in the $400,000 First Lady (GI) at Keeneland on Oct. 3. That race is run at one mile, which Casse says is ideal for his filly. Prior to her second in the Ballston Spa, Tepin was also second in the Diana (GI) at the Spa, both races were run at a distance of 1 1/8 miles. Also on the work tab for Casse was Live Oak Plantation’s World Approval, who worked a half-mile in :50.60. This was the Florida-bred son of Northern Afleet’s first work since a triumph in the Saranac (GIII) on closing weekend at Saratoga,. He could make his next start in either the $500,000 Hill Prince (GIII) at Belmont Park on Oct 3 or the $100,000 Bryan Station at Keeneland on Oct 30. Midwest Thoroughbreds’ champion sprinter Work All Week also returned to the work tab on Friday morning for trainer Roger Bruggemann going a half-mile in :48 flat. The Illinois-bred son of City Zip, winner of the 2014 Breeders’ Cup Sprint (GI), will be looking to defend his title in the $250,000 Phoenix (GIII) on Oct 2 at Keeneland. SEPTEMBER MEET JOCKEY’S TITLE IS STILL ANYONE’S RACE- With seven days left of the September Meet, there is a three-way tie for first place in the jockey’s standings between Corey Lanerie, Shaun Bridgmohan and Jon Court, each of whom has five wins apiece. Lanerie, the leading rider in the past six meets at Churchill Downs, and Court both have five mounts on Friday’s card. Lanerie rides Bear’s the Name (Race 2), Escape Artist (Race 4), Conrad (Race 6), Sluiceway (Race 7), and La Macchina (Race 10), while Court rides Lil Abby Jo (Race 3), Thrylos (Race 5), Zimmerman (Race 6), Millennium Star (Race 7) and Majestic Ride (Race 10). Bridgmohan only rides two on Friday with Holding Aces (Race 8) and Skywarn (Race 9). DOWNS AFTER DARK RETURNS SATURDAY AT 6 P.M., THEME IS ‘SUMMER SUNSET’ – Presented by Stella Artois and Jack Daniel’s, special Downs After Downs nighttime racing returns Saturday for “Summer Sunset” – a celebration of the final days of summer. Guests are encouraged to wear their favorite summer fashions for the 11-race program that begins at 6 p.m. (all times Eastern). Entertainment on the Plaza stage will be provided by A Lion Named Roar and “Bet Or No Bet Presented by Thorntons” will give four lucky fans a chance to win big prize money on Races 6-9. The specialty cocktail drink that evening will be the Jack Daily made with Jack Daniels Honey, lemonade and iced tea. ‘INSIDE CHURCHILL DOWNS’ TO AIR SATURDAY AT 11 A.M. ON 93.9 THE VILLE – “Inside Churchill Downs,” the horse racing radio show co-hosted by Churchill Downs Racetrack’s John Asher and Darren Rogers, returns Saturday from 11 a.m. to noon on 93.9 The Ville.